Hello friends and visitors! I am thrilled and honored to be here today, joined by so many friends to celebrate World Autism Awareness Day! In addition to the fantastic Blogs that are participating in today's hop, we have a FANTASTIC line up of sponsors who have generously donated prizes and time to make today a super fun day of friendship, support, and fabulous prizes! Today I am hopping for my 7 year old, beautiful, kind, and sweet boy Cameron. Isn't he beautiful? I love the way this picture captures his sweet nature. Love that kid so much! 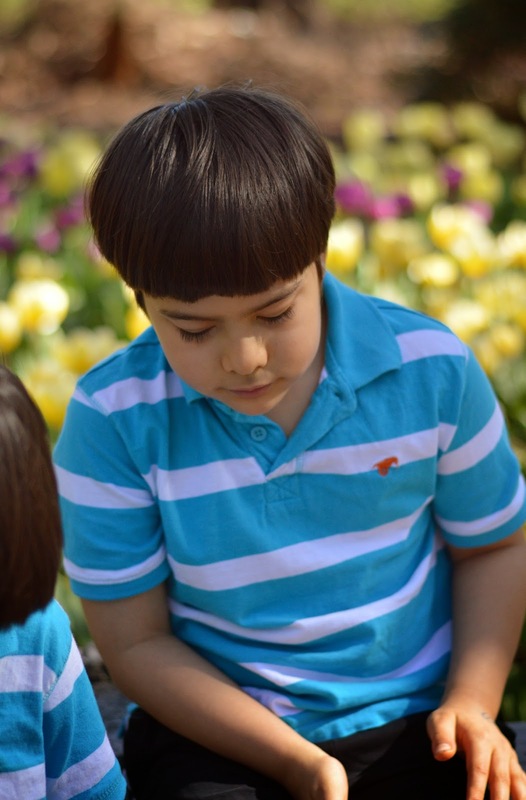 These are some of my favorite places to read about Autism Awareness. Autismspeaks.org, and Autism Daddy. He makes me LOL all of the time. Sometimes you just have to laugh. Now, I am SUPER excited to share the card I created for today's blog hop. It features the BRAND NEW My Favorite Things stamp set Super Boy and it will be available for purchase on April 7 at 10PM EST! My MFT Challenge Team-mates and I were given special permission to share this set with you today! I knew it would be perfect for today's hop because Cameron is MY Super Hero! 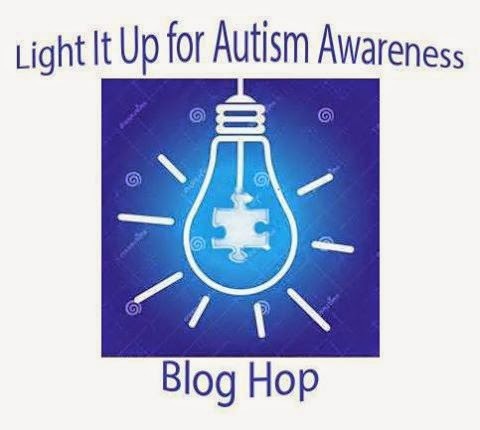 Now there are SO MANY amazing bloggers that have joined me today, including my dear friend and co-creator of the Light It Up Blue For Autism Awareness Blog Hop Tenia Nelson. Love ya girlie! Alrighty, here is the link list that has a link to all of the sponsors who have donated prizes for the hop followed by links to all of the bloggers who are hopping along with us today! How do you win prizes you ask? Winners will be chosen at random from comments left on Blog Hop participants blogs. The more comments you leave, the greater your chances will be at winning! Winners will be chosen on Monday April 6th. Thanks for stopping by and Happy World Autism Awareness Day! I love the image. It is perfect. Congrats to a successful hop and for raising awareness. Your card is PERFECT, Veronica! LOVE it! LOVE LOVE the pic and the card!!! You have one special kiddo!! Thanks so much for being awesome!!! I LOVE you, girl!!! He's gorgeous! And so is your card. Everything about your post shows just how much you love him. Thank you for organizing this hop, Veronica! Happy World Autism Awareness Day! Your son Cameron is a sweet boy! I love your card - gorgeous background and the new MFT stamp set is awesome! I can't think of a better way to spend Autism Awareness Day than looking through a bunch of fabby cards. Thanks so much for organizing this! A fabulous card for a superhero and a great blog hop. Fabulous card!! Love the peek!! Thanks for organizing all this!! Super sentiment and image on your card. I like the blue rays. Oh, Veronica! This is cool. Love how you muted the rays with vellum to make your super hero stand out. Just adorable! Beautiful post. Thanks for allowing me to be a part of this AMAzing hop. Your card is great, so excited about this new set. How perfect is that little superhero! Thank you so much for organizing this hop, Veronica - I have a feeling I will be tearing up a lot reading everyone's stories today :) Mwah! Love your superboy card - what a fun new stamp - and Cameron is a sweetie! My niece works with Autistic children. Veronica, I love this card and your reason for making it. (Can't wait to see this new set by MFT) That photo really does capture your son's beautiful nature, so glad to be hopping along with you! Beautiful card, Veronica! I love it and the photo of your son is gorgeous! Thanks so much for putting together this hop!! you out did yourself~super cute!! Love it!! Thank you for putting this hop together :) you and Tenia. Veronica your boy IS so very beautiful! What a fabulous cause... thank you! OH! I actually wrote to Kim at MFT about a year ago and requested a boy super-hero - this makes me smile from ear to ear! Love your card and this cause! Can anyone with a blog link up a card for Autism Awareness Day? I would love to create a card for this wonderful cause!! Adorable image and card. What a great way to bring awareness to Autism. Such a great card! What a beautiful boy you have! Lucky mom! Your Cameron is precious, just as you are; he was born into a family who would love and protect him perfectly! His life is enriched in being with you; you, in being with him. Your card: what else to say but I LOVE it! Thank you for the opportunity to join this blog hop; such an honour! I adore your card and this new awesome image!!! I just recently heard about this hope and think it is a fabulous cause. Love the picture of your sweet son and a big thanks to you and Tenia for putting this all together! What a special boy(Cameron) you have!! This is a great hop raising awareness for Autism. Your card says it all!! Thank you Lori! And yes, anyone can join the hop! You have until Monday at noon to link up!! What an AMAZING event!! Your card is adorable! Es muy fácil amarlos. Grandes héroes! Love this card!!! Its a beautiful bloghop. Such a sweet picture of your little boy Cameron! I have two co-workers with autistic boys in their family. I never really knew much about autism until talking to them about it! Beautiful card!! Love that bright blue background! What a wonderful tribute and an amazing cause. This is so great that you are doing this to raise awareness. Ready to hop and this is a great way to raise awareness about Autism. Wonderful card for a great cause! Absolutely perfect card and lovely post. Your card is just wonderful! A wonderful card and a wonderful cause!! Such a cheerful, adorable card! Your card is just amazing, and I love that photo of your beautiful boy. Love this sweet pic and super card! This is going to be a great blog hop for Autism Awareness. What a great way to honor Cam and spread awareness! I love your card, the papers are so fun, and you are AMAZING too! Loved being part of this hop Veronica. Love your card and give your son a giant hug from me! First off Cameron is precious. I'm so glad you have him to brighten your life. Your card is wonderful. I love it. Thanks for sharing and for helping to raise Autism Awareness. Thanks to all of the wonderfully generous sponsors. Love your Super Hero card!!! Thank you for all your hard work on this hop! This is SO gorgeous! Love the rich colors! And such a handsome boy you have!!! HUGS, friend! What a perfect card to bring awareness to Cameron and all the other special people on the spectrum! Love your card! Una idea genial para hacer pensar en estas grandes personas, que dan tanto cariño a todo el mundo. Preciosa tarjeta para tu héroe!!! I was honored to be a part of this amazing hop. You did a great job with your team putting this event together.. I just posted on over 112 posts and my hands are exhausted! I thank you for doing this!!! That is one fabulous card! Cameron is such a sweetie, Veronica! So happy to be part of this blog hop to raise awareness! Beautiful card and such an adorable image! I could sense the magnificence of Cameron's spirit and I just wanted you to know how thrilled I am to join this hop and help raise awareness!! You and Tenia have done a lot of work so THANK YOU SO MUCH!!! Your card is a reflection of how I feel about you - You are ALSO a SUPER HERO!!!! Thank you!!! Veronica, your card is wonderful! Your son is so cute! This card is adorable! It's perfect for today's hop! Very inspiring! What an amazing turnout and fab way to raise awareness! Love your card for your sweet little super hero! A great card for a sweet boy. What a great hop! Great card - great cause. Gorgeous card for a gorgeous boy. I love it! Fabulous hop for a wonderful cause!!! Congratulations on such a successful event!!! And your card is fantastic!!! Perfect for a super hero!!! The picture of your darling son melts my heart. He is a true super hero in my book. Thank you for starting this blog hop to raise awareness for autism!!! You rock! Your super hero is so cute and your card is too. although my son and grandson are at the lowest points on the spectrum I have learned a lot. My daughter has a wellness studio and has geared Saturday morning 10 to 12 Zumba and crafts for children that don't fit in.Once a month on a Saturday from 6 to 9 there is a themed Zumba party so the parents can go out and have dinner without children, I am very proud of her. What a great cause and a wonderful blog hop. Love your card. Veronica, thank you so much for putting this hop together in honor of Autism Awarness Month. It's such a great thing to see so many people on board. The entire blogosphere is blue! Your card is incredibly bright, graphic and downright adorable! Your card is adorable and this is a great way to raise awareness! What a fantastic hop for Autism! Your son looks so sweet! great stamp and great hop with a purpose!! Amazing event....this card is so beautiful. Thank you for share this great cause. Adorable photo AND card, Veronica! SO glad you poured your heart into this blog hop to spread awareness!! What a super cute ard and great idea to spread awareness! That little guy is so adorable, a super hero, love it! A sweet card for a super sweet young man! Thanks for this brilliant idea of raising awareness! He is so cute! What a cute card! What a darling card to make a little boy feel like a Super Hero. the rays in the background are great. The coloring is wonderful. Your Cameron is our super hero ,too! I love love his photos over the FB and really had the honor to know more about Cameron and you...HUGS! And thank you and Miss Tenia for doing this! What a gorgeous card. Love that set; I may "need" it soon. This cause is close to my heart since I have a super hero too. Watching my son deal with his different abilities leaves me in awe every day. Cute and very special picture. SUPER fantastic card. Great blog hop. Thank you! I love your super hero card. So perfect for recognizing our young hero's with autism. Thank you for turning the web blue to bring notice to this condition! Un niño adorable me encanta esa foto y la tarjeta quedo muy linda!!! This is image is so perfect and you're right your son does look so very sweet. A picture to treasure forever for sure. Thank you for organizing this wonderful hop for more awareness. Your card is super-cute! Great idea, and nice card!!! It's full of positive energy! A fantastic cad and a great way to raise awareness. TFS! Love your awesome card for the Light It Up Blue hop! Great stamp! What a sweet picture of your son! So super special and exciting to be able to sneak peek the new MFT Super Boy stamp set. Love the You're Super stamp set and was just thinking how we needed a super boy! Gorgeous paper piecing on the card and love the dimension you created! This blog hop is such a wonderful way to bring awareness to autism! Thanks so much for organizing it! Super card for your boy !! Good luck with the blog hop, I'm sure it will be a huge succes ! And the more people read an know about autism, the better. Great Hop for a wonderful cause.. I'm joining in!! My son was diagnosed at 18months. He's now 13. ...thanks for making this hop I will try my best to Join in..
Fabulous! That Super hero is perfect - so cute! What a great way to honor your son. And with so many friends that joined in. this is just awesome. I love your card. It is perfect and I can see why you wanted to use it so much. Your boy is adorable and well loved. that is a blessing. sending you hugs and encouragement. Awesome idea to raise awareness and what an wonderful stamp set to get the party started! Love your card. What a fun card! I love it. Your handsome son does look like he has a sweet nature. Sometimes it is hard to tell in photos. Thanks for sharing with us today. Super card Veronica! I can see why Cameron brings you much JOY!! Your card is absolutely ADORABLE....perfect for your SWEET boy! Thanks for all your hard work...I'm off to hop! Lovely card, Veronica! Congratulations on the response of the blog hope. I hope the outcome is more than what you expected. Brilliant card! Your little man looks so sweet and I know he is precious. Thanks so much for this hop and helping to raise awareness of our autistic kids. They have brought me joy for the many, many years I have worked with so many on the spectrum. Awesome Card and a wonderful cause that is being highlighted here. Super cute card and such a handsome boy! I have two children with Autism. I'm happy to see this blog hop bringing more awareness to the challenges of autism. LOVE LOVE LOVE your superman card, awesome card for an awesome kid! Cameron looks like a real sweetie and your card is such fun! Thanks so much for organising this lovely blog hop. What an awesome card and a wonderful cause to support!! Hugs to you and sweet Cameron! Your card is awesome! Im sure Cameron is a SuperHero! What a great cause - and I love your card. Thanks for the links to learn about autism. Thanks for hosting such a great blog hop! Cute card as well. You're right, they are super heroes, and you also! Love your card and your boy is beautiful! THank you for organizing this hop! Beautiful card! Your son is such a great inspiration, plus he is a handsome boy! Thanks for organizing this hop, Veronica!! Such a beautiful and wonderful photo of your handsome son !!!! I love the way you are raising awareness to such an important cause ! Your card is perfect , I love the super hero !!!! A great card for a great cause! Your son does look beautiful. So glad so many are willing to sponsor for such a cause. THANK YOU for hosting this FABULOUS Blog Hop for Autism Awareness Day Veronica!!! It looks like being an EVEN MORE AMAZING event than last year, a sign that so many lives have been touched by it. LOVE the CUTE card you have created for Cameron - THANK YOU for sharing your creativity, caring and hop!!! Well you did it! Created a wonderful card and raised awareness for a very deserving cause. So many wonderful children affected by autism and we need to understand it more. Wow this card is awesome thank you for your kindness and the awareness of autism. 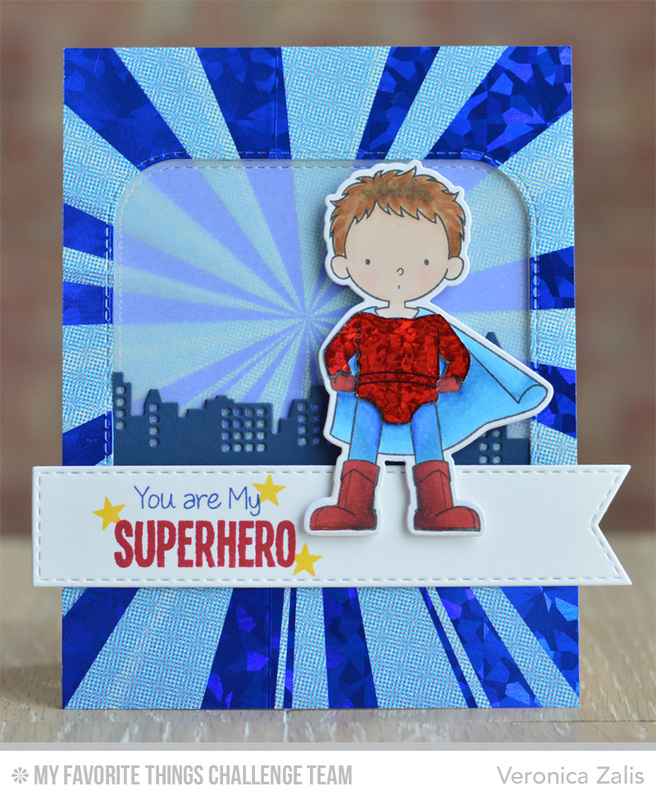 Great work putting this hop together, on your fabulous card (love the new MFT stamp) and with your amazing Super Hero. Thanks for supporting the cause that effect so many of us. A wonderful cause and a "super" card! Thanks for sharing your wonderful card and for helping spread the word about autism. What an wonderful post and amazing card. This hop is FABULOUS! Thanks for sharing all the beautiful cards made to honor Autism Awareness month. Your card is beautiful and made me smile. Thanks for sharing. An amazing hop for amazing people! Sweet pic f a beautiful boy! Fantastic way to spread awareness, congrats!! Indeed a great cause, I was asked by my friend, who has an autistic child to make a card to show my support, and I am so very glad to be part of this great cause. This is a wonderful way to spread Autism Awareness and the links to read more about this. Your card is wonderful and love the scene you created. Love the super hero card, it reminds me of my boys. My heart goes out to all those affected by autism. Thanks for spreading the awareness. So many awesome cards to raise awareness! Thanks for sharing a picture of your son and a fantastic card. Through awareness comes education. Thank you to all who helped!! What a SWEET pic of your Son!!! Great Cause & Wonderful Blog H O P!!! I was delighted to find this blog hop in aid of Autism as our 8yo son has low spectrum autism. He is a wonderful boy, much loved by many. Your card is beautiful! I have managed to comment on all but 3 of the 169 entries as a way of saying THANK YOU for raising awareness of autism. Thank you to all the sponsors for supporting this cause too! Thanks so much for this hop. Our family is affected by autism spectrum. Wonderful card for a wonderful cause. I love your SuperHero!! Thank you for shining a light and for sharing the pic of your sweet son. What a super card, Veronica, and for a great cause! Cameron looks adorable and is very fortunate to have you as his mother helping with the awareness of Autism that affects so many. You've certainly got a great following with all your blog hop members and prize sponsors ~ awesome work! Veronica I love the stamp you used. Your card is sweet and your son IS beautiful! I pray that with this outreach for awareness some help will be found to make your lives easier and better. You are truly blessed! This is fantastic, Veronica! I love this card! I'm so proud of you for putting this hop together! You are amazing! Cameron is lucky to have such a great mom and you're lucky to have such an awesome kid! I'm so excited for this blog hop, thank you so much for putting it together! I love the picture of your Super Hero, and the card you made is wonderful as well! Thank you for this wonderful blog hop, celebrating such a great cause, Autism Awareness! Love your card Veronica! Thank you for Organising this awesome blog hop for a worthy cause! I love your superhero card, as well as your son!! The card fits perfectly for any child with autism. Thank you for starting this blog! What a fabulous card. So glad to participate in such a fun and talented way to raise awareness. wow! The background on this card is truly amazing! Thank you so much for your work in putting this together and raising awareness for Autism. Oh my...I left comments on all the blogs and almost missed you! A simple THANKS for sharing the message out there! This has been a great experience! Such an awesome hop, loved seeing everyones creativity. Wow! I love this card so much! All the little details are so perfect. Thanks so much for a wonderful event! Super card, Veronica! I just got in under the wire with mine! Great hop!